Have you been to to the Cannibal yet? I've been a few times, and just realized recently how awesome this place really is. I stopped in a few weeks ago and was blown away with everything about this joint. The Cannibal is a beer and butcher shop. A cafe and retail shop by day, a charcuterie/small plates joint by night. It's the perfect laid back place to grab a beer or wine, and nibble on some truly delectable bites. With a relaxed vibe, a superb beverage program, and top notch fare, this place is truly wonderful. Chicken liver mousse ($11) comes with cocoa nibs and shallot jam, is heavenly. 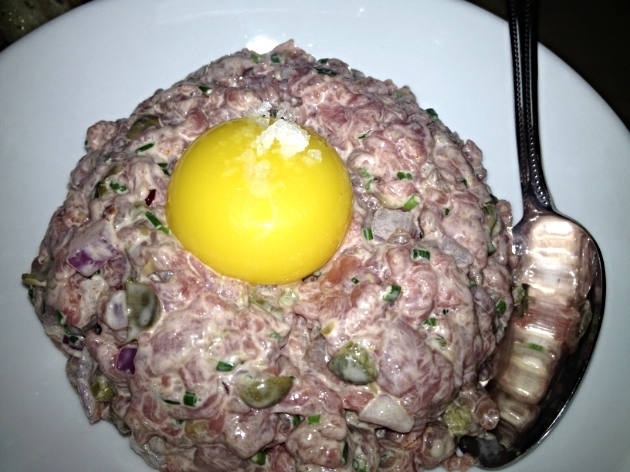 Lamb tartare ($16) comes with with red onion, capers, harissa aioli, and egg yolk. Truly fabulous. Chanterelle mushrooms with soft scrambled egg, and country ham gremolata is unbelievable. The sausage program at the Cannibal should not be missed, it could very well be the best in town. Thai sausage ($11) with peanuts, jalapeño, and scallion, is fantastic. Merguez sausage with mint, yogurt, and roasted carrots was pure greatness. So pick up a seat at the bar or butcher counter at the Cannibal, grab a beer or wine, have a bite, and enjoy life.